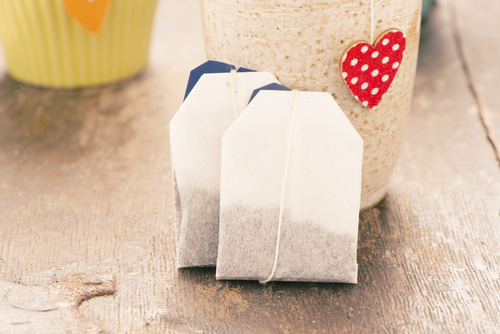 DIY Methods To Remove Eye Bags: Use These Home Remedies To Say Goodbye To Puffy Eyes! The bags under my eyes are designer and they never go away! Ladies, can I hear a hallelujah if you also don't get enough sleep every day just like me! Regardless of what I do and how early I crash, I will still be up late at night making up scenarios in my head that will never come true. Suddenly I am awake with just three hours of sleep and puffy eyes, thinking about how to remove eye bags. Now don't get me wrong, I am no stranger to eye gels and eye creams and even eye masks (if I have a little more time), but somehow for this one problem, I feel the DIY kitchen remedies that I whip up with all natural ingredients work best. So, how to reduce eye bags naturally? 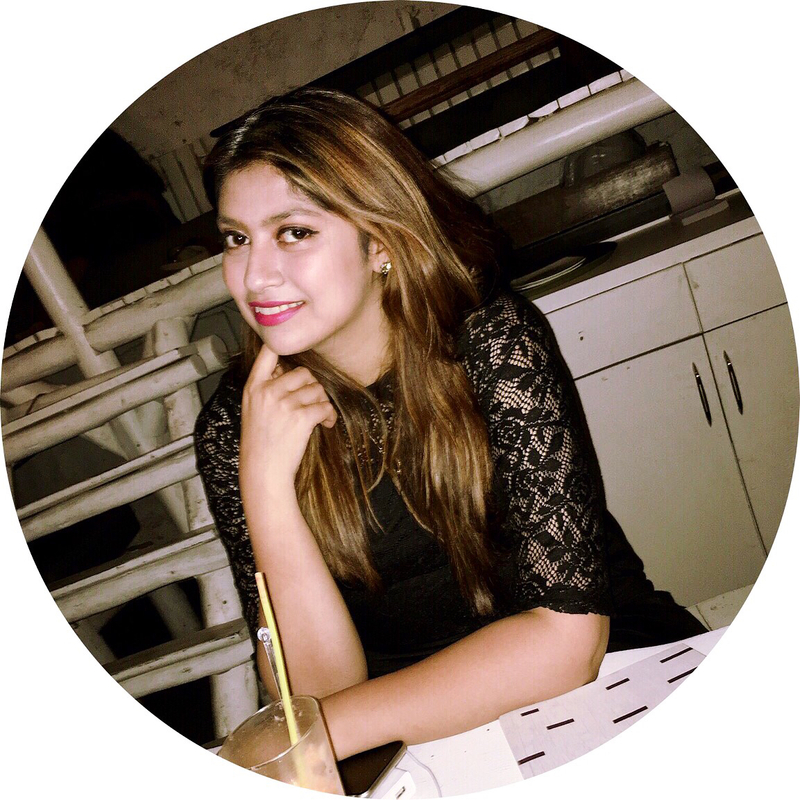 Well, Here are my favorite DIY natural home remedies which are the simplest ways to get rid of puffy eyes! 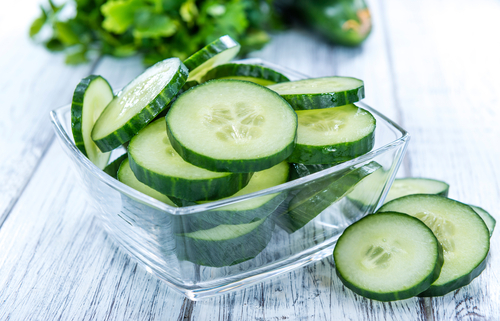 Cucumber is a natural astringent, constricting the blood flow to the under eye bags. It cools, soothes and reduces inflammation! Take a couple of slices of chilled cucumber. Place them on your eyes and leave on for 10 mins. Do this every time you have any sort of inflammation. The Vitamin C present in lemon juice removes the toxins which lead to making our eyes look puffy. This remedy will also help you to get rid of dark circles as lemon juice lightens the skin tone. Mix the lemon juice with milk. Dip a cotton ball into the mixture and apply it on the bags under eyes. Air dry and rinse with cold water. Potatoes have anti-inflammatory properties, perfect for treating under-eye bags. The starch also ensures the tightening of the skin and also has a brightening effect. So, let us see how to get rid of puffy eyes? Peel, wash and grate half a potato (if it's a full-size potato). 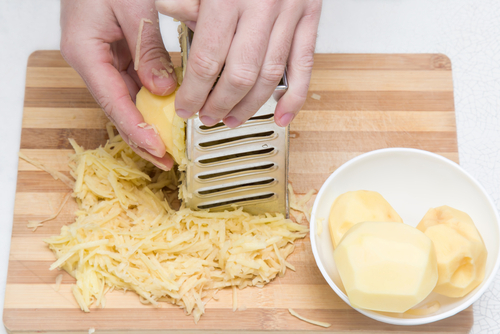 Put the grated potato in 2 small scraps of cotton or cheesecloth and tie it up. Place these bags over the eyes for 10 minutes. Massage your under eye areas with a light hand. Are you also wondering how to remove eye bags? Well, this one is my favorite hack. I usually have 2 metal spoons chilling in the freezer almost every day. They help constrict blood flow and tighten the skin while reducing inflammation. 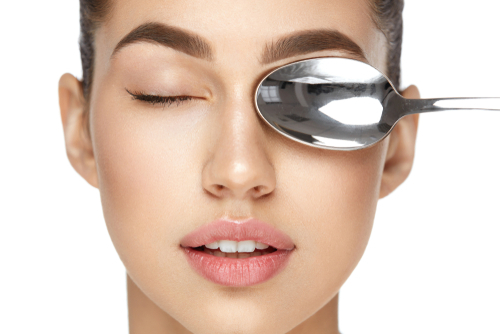 Place spoons in the freezer for a minimum of 15-20 mins at least to remove bags under eyes, if not overnight. Hold the rounded portion against the eyes and massage for a few minutes until the spoon warms up. Collection of fluid under eyes is a reason for puffy eyes. Any caffeinated tea, either green or black, contains natural tannins which are a mild diuretic (which increases the fluid flow). Therefore, it helps to de-puff the eyes and tighten the skin. So, how to remove eye bags using tea bags? Steep tea bags in hot water for 3-4 minutes. Place the bags in the fridge for a few minutes to chill. Then leave them on the eyes for about 10-15 minutes. 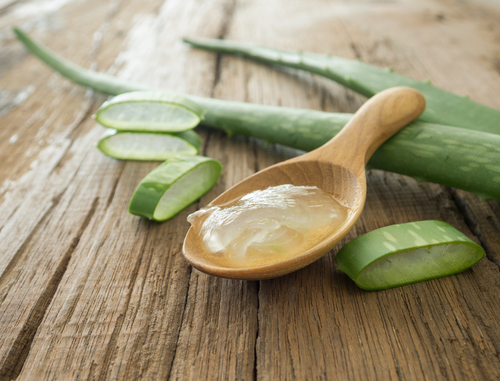 The antioxidants and vitamin E in Aloe Vera are effective in reducing puffiness. Applying them around the eyes causes improved blood circulation. Just be careful to not get any drop in your eyes. Just apply Aloe Vera Gel around the eyes and massage upwards. Also, massage under the eyes in a circular motion. You can leave the gel on or wipe it off if you're planning on applying makeup. 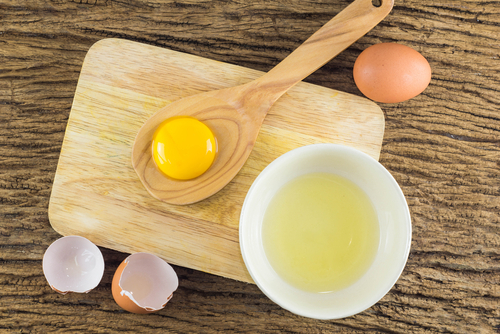 Egg whites help to tighten up the skin and reduce puffiness. It is also effective in reducing wrinkles. Whip up an egg white in a bowl. Cut a cotton pad in half and dip it in the whipped egg whites. Apply it under your eye like an eye mask and leave it on for 5 mins. Then rinse. Applying a wet washcloth on puffy eyes can give instant relief and may help to lessen the size of eye bags a bit. Although it is not as effective as the others, it is the simplest of all to go for when you have nothing else to help. Wet a clean cloth using cold water. Make a little ball of the cloth and press it gently under your eyes. Essential oils have a soothing property which is good for under eye bags. You can choose any essential oil which suits your skin. Mix one drop of chamomile oil, one drop of lavender oil, 1 drop of lemon juice and 1 spoon of water. Apply this mixture under your eyes and massage it gently. Coconut oil contains anti-inflammatory properties and lauric acid. Regular massage with coconut oil can soothe under eye bags. Use extra virgin coconut oil to massage under eyes. Leave it for few minutes and then rinse with cold water otherwise leave it overnight. This paste containing coffee, coconut oil, and black pepper is one of the best home remedies to remove eye bags. Coffee has caffeine which has anti-inflammatory properties. Black pepper increase the blood circulation which is good for skin and coconut oil will moisturize your skin. Mix one teaspoon of coconut oil, ½ teaspoon of coffee powder and a pinch of black pepper. Apply it carefully under eyes and let it be there for 12 minutes. It promotes blood circulation and also imparts a glow under the eyes. It works as a natural exfoliant too. Mix one teaspoon of baking soda with one cup of baking soda. Now soak cotton pads in this solution. Remove the excess water from the pads and place the pads on your closed eyes. Apart from moisturizing the skin, petroleum jelly reduces irritation, swelling, and soreness. Apply it under your eyes every night before sleeping. b) Include collagen-rich food, iron-rich food, and vitamin K rich food in your diet like leafy vegetables, broccoli, sprouts, carrots, strawberries, oranges, and liver. Hope these remedies for eye bag removal at home help you out. However, seriously one thing that recently has helped me immensely is just massaging my under eye area and the area around the eyes before I sleep. The lymphatic drainage makes sure you don't wake up with puffy eyes.